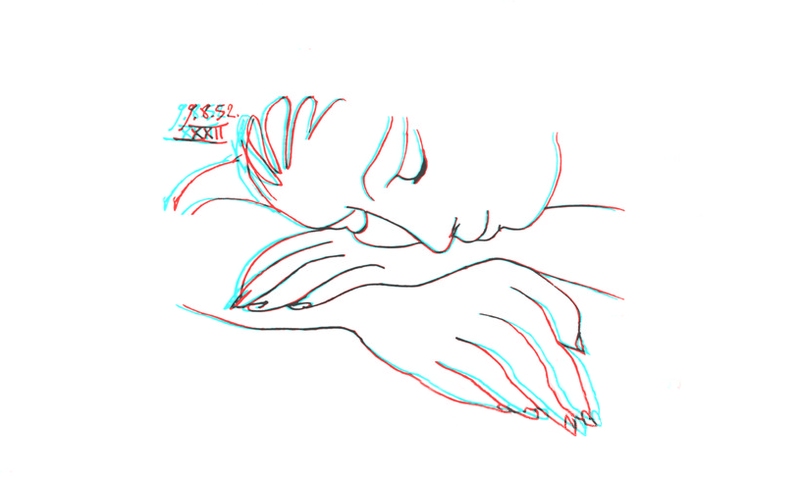 Unless they are in anaglyph format the stereoscopic still image pairs embedded on this page are formatted for cross-eye free-viewing. First class meeting. Announcements about the ongoing World 3-D Film Expo at the Egyptian Theater in Hollywood. A brief discussion and demonstration of binocular parallax and visual perception. Comments on the primary differences in fixed POV stereoscopic displays and the interactive parallax of the variable POV of HMD’s etc. A brief discussion of depth scripting. A look at the course website from last year. Demonstration of how to view 3d playback from the computer workstation, sandin, via the HDMI connection to the 47″ passive 3D monitor. View 3D slide show of last years end of semester Course Exhibition in the B&W studio gallery A404. View Tole Mour VOTF 12: Blue Whales Across the Bow, and Tole Mour VOTF 12: Endless Sea Lions as examples of Stereoscopic GoPro video shot using the GoPro 3D rig available from the School of Film/Video equipment cage. Second class meeting. Shayne Hood came in to teach the class in my absence while I was at the CILECT 2013 Conference in Buenos Aires. Screening of Part I, Part2, Part 3, and Part 4 of Brian May’s, A Brief History of 3D. 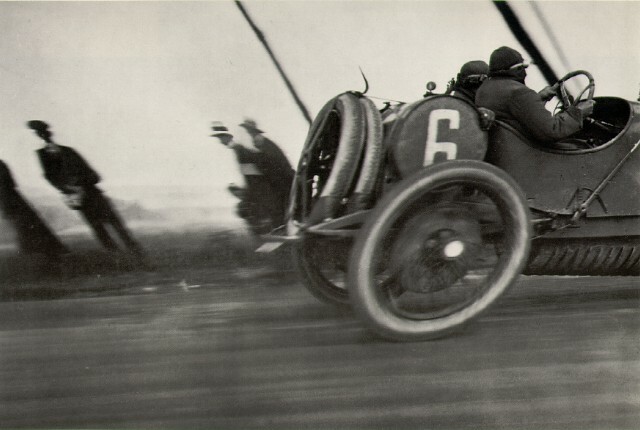 The principles of stereoscopic photography with a single lens camera via the horizontal-shift/sequential-shot technique known as the “Cha-Cha” method was demonstrated. Shayne worked with Ben Reicher and Michael McNeff to get students set up to use the Parallels Desktop virtual machine in order to run Windows on the Mac’s. Once this was set up students were able to begin learning how to process their Cha-Cha shots using Masuji Suto’s free 3D editing program StereoPhoto Maker (which only runs under the Windows OS). Third class meeting. We looked at sets of stereo images via several stereoscopic viewers I brought in (including two plastic viewers and slide sets that I picked up on visits to Poland and Russia in ’89 and ’90), A classic reproduction of a Holmes/Bates stereoscope with reproductions of early stereo cards. Brian May’s OWL folding stereoscope and stereo card sets, a 35mm dual slide viewer with Cha-Cha slides that I shot in the late 80’s, and a set of Stereo Realist format viewers with mounted photos I had shot with the Stereo Realist camera that Ed Emshwiller had loaned me for the summer I spent traveling to European media festivals in 1990 . Our course TA, Ben Reicher, screened his 3D film project from last year, Awesomeforce Part II (3D). We viewed a rough edit of a 3D slide show from my trip to the Cementario de la Recoleta from shots made with my Fuji W3 3D camera jut a few days earlier. An edited version is now available online (although as of this posting several of the photos still need adjusting via floating windows, etc.) We ran out of time to do much more than have a cursory look at the stereoscopic photo experiments students shot and edited the week before. We will look at those in more depth at the start of next weeks class. Fourth class meeting. Look at two antique French stereo viewers not seen last week. View and discuss student Cha-Cha photos as edited in StereoPhoto Maker. Demonstrate Cha-Cha technique with Masuji Suto’s 3DSteroid Pro on CameraPhone. Look at Susan Barry’s book “Fixing my Gaze” and an online video talk excerpt. View “‪Diving at ElQuseir in 3D‬” and discuss negative parallax, floating windows, and image shear. View scenes from Martin Scorsese’s “Hugo” and background promo clips. Fifth class meeting. Introduction to the creation of wiggle stereoscopy via the New York Public Library’s interactive online site, Stereogranimator. The NYPL site created by Joshua Heineman, allows users to create wiggle stereo from a vast collection of 19th century stereo-cards. After a bit of hands-on experience creating wigglegrams via that site, we looked at how StereoPhoto Maker allows for more control and created some test wigglegrams, using Masuji Suto’s StereoPhoto Maker After that hands on experience we looked at Ken Jacobs‘ stereo card flicker works Capitalism: Slavery and Capitalism: Child Labor. The second part of the class was dedicated to a demonstration and hands-on tutorial on the creation of phantograms. Seventh Class Meeting. View the new commercial, Honda Illusions, as it relates to our discussions of anamorphosis when making phantograms. Demonstration of the CalArts 3D GoPro rig using Hero2 cameras. 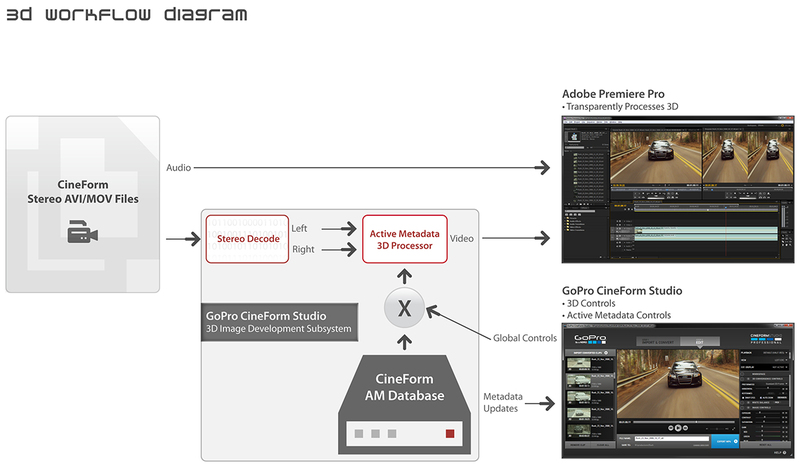 Demonstration of the Cineform GoPro Studio Pro software package to convert left and right camera movies from the GoPro 3D camera rig into the Cineform codec and then multiplexing it into a Cineform 3D mux file for editing as a 3D movie. Exploration of the use of Cineform GoPro Studio Pro to edit stereoscopic 3D within Adobe Premeire Pro CS6 based on the Adobe TV tutorial demonstrating earlier versions of the software, Cineform Neo3D for Mac with Adobe Premiere Pro. Tenth Class Meeting. Discuss binocular rivalry and luster using examples from class web page. View Shinterra’s award winning stereoscopic short film, 27 Years Later, followed by the opening 15 minutes of Wim Wenders‘ stereoscopic masterpiece, Pina, followed by the first part of Henry Selick’s equally masterful Coraline. Viewing One of Dalí’s Intense Binocular Rivalry Paintings at the Dalí Theatre-Museum in Figueres. Thirteenth Class Meeting. Semester wrap-up. The previous week Kanlun Cen asked if I would conclude with the IMAX and OMNIMAX part of the Large Format Exhibition presentation. I continued my research on this and presented that material in class. I spoke about the history of dome projection from Walther Bauersfeld‘s geodesic frame reinforced concrete dome designed and constructed as a screen for the planetarium projector he created for the Carl Zeiss company to the recent proliferation of fulldome projection spaces. I touched on the importance of the Vortex Concerts staged by Henry Jacobs and Jordon Belson at the Morrison Planetarium in San Franciscco and of Stan VanDerBeeks’s Movie Drome work and his prescient Manifesto for a Cultural Intercom. I introduced the Domemaster Stereoscopic Shader for Maya and 3DS Max as tool for creating fulldome stereoscopic work and recommended the upcoming fulldome conference, State of the Arts 2013: The Future of Fulldome. I also spoke about Ivy Flores’ MFA thesis installation, A Scenic View of the End of the World, which was originally conceived of as a dome projection. Ivy modified her idea and adopted a plan to create a more effective installation composed of hanging strips used as reflective and transmissive screens. The work that alum J.Walt Adamczyk has been doing with fulldome stereoscopic realtime animation in his Spontaneous Fantasia shows –and of his need for very powerful computers to minimize lag with multiple projector tiled image projection on the domes was discussed. After the break we explored two demo environments designed for the Oculus Rift wide field of view stereoscopic head mounted display, Tuscany, and Titans of Space. During a discussion on immersive imagery and sources of research funding I spoke about the Aspen Movie Map project that Michael Naimark had worked on at MIT –and of its relation to Google Street View and military mission rehearsal. 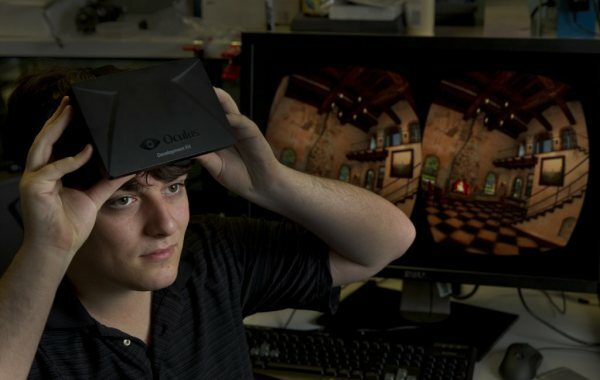 Palmer Luckey donning the Oculus Rift Developers Kit 3D HMD with the “Tuscany” Demo on Screen.